On an overseas trip in 2004 I took my digital camera and a laptop. My spouse and I agreed in advance that the laptop would have just two uses: storing digital photos taken on the trip, and watching DVD movies if the weather was bad. No E-mail, no Web browsing, no office memos — nothing else. It was a wonderful trip, but the 20 gigabyte drive on the PowerBook G4 proved to be no match for modern digital photos. The PowerBook had Mac OS X, various database programs, Microsoft Office, and a bunch of other stuff, with only 7 GB of free space. After filling all but a fraction of the drive with photos, we couldn’t empty the Compact Flash cards at the end of the day: there was no room on the PowerBook. We ended up trashing Microsoft Office and virtually every other application in order to make room for photos. Some research revealed that the P-1000, no longer made, was the first in the series, with a 20 GB drive, followed by the P-2000 with a 40 GB drive and now the P-4000 with drive capacity doubled once again. 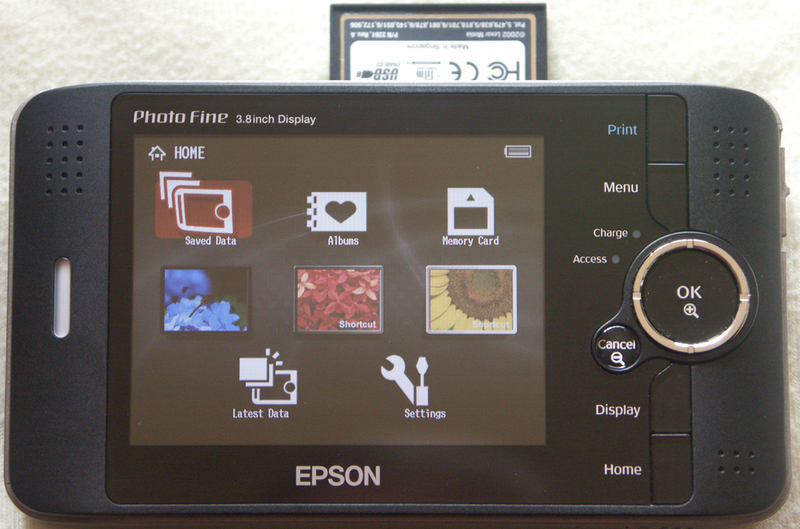 The drive is formatted with a Windows-style FAT32 file system, leaving 73.8 GB of space for photos. According to the documentation, the P-4000 can store JPEG and RAW digital photos as well as MPEG4, MP3 and AAC audio-video files. It is far smaller than a PowerBook, and weighs less than a pound, making it far lighter and even more transportable than a PowerBook. The internal battery allegedly lasts for several hours of use, and the AC adapter/battery charger supports any current from 100-240 volts, 50/60 Hz, though the prongs are designed for North American wall sockets. Taking another overseas trip this winter, this time without a PowerBook, the Epson P-4000 proved to be much easier to carry. We had fewer security concerns in airports or public places since the small size made it uninteresting to security personnel and possible thieves. We rarely turned it on much longer than to dump photos into it and take a quick look at them on the 640 x 480 display. You can’t watch DVD movies on it, but you can watch your own QuickTime clips. Copy files from the P-4000 to your computer using a supplied USB cable. The P-4000 supports USB 2.0, so if your computer has USB 2.0, it is quite fast. On an older computer with USB 1.1, the drive still works, but is much slower. Use a Settings menu to adjust the P-4000 to your needs and whims (see photo). 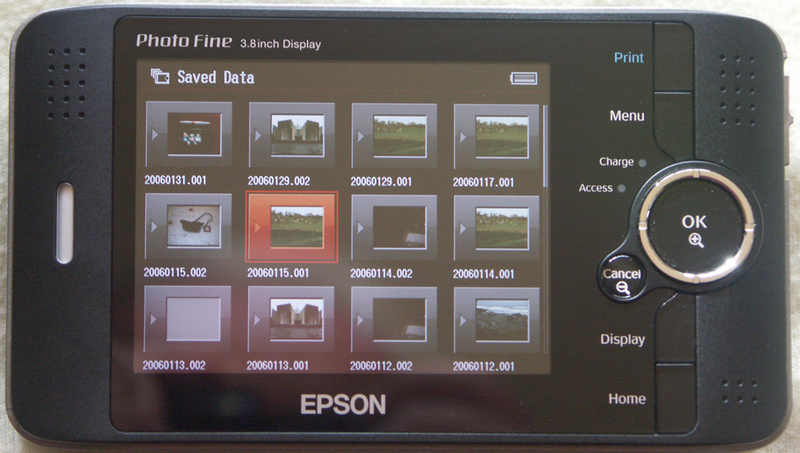 It is also possible to delete photos on the P-4000, but that is a bad idea. Wait until you get back to your computer, dump your photos onto your computer, and back them up to CD-ROM before you start purging. CD-ROMs are inexpensive; an accidentally erased photo can be irreplaceable. 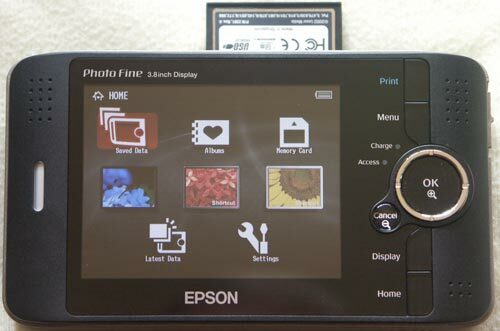 Epson provides a very simple way for you to move your photos around into “Albums” but, as mentioned above, there is a catch: it renames the photos. No matter what the photos were named before, putting them into an album – and an album is nothing more than a named set of photos, such as “Vacation” or “Wedding” or “Sheep” – the P-4000 renames the files to a serial series starting with “EPV.” This causes great confusion if your camera serializes the names of photos. 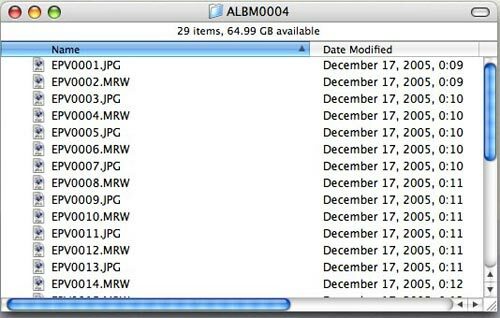 You might know, for example, that you took PICT3406.JPG through PICT3517.JPG in New York, and if the P-4000 renames these files to EPV001.JPG to EPV111.JPG, you’ve lost all ability to keep track of photos by name. If you use the P-4000’s “Album” function to arrange photos in logical sets, it has the unfortunate side effect of renaming photos. Fortunately, you don’t have to put up with this behavior. 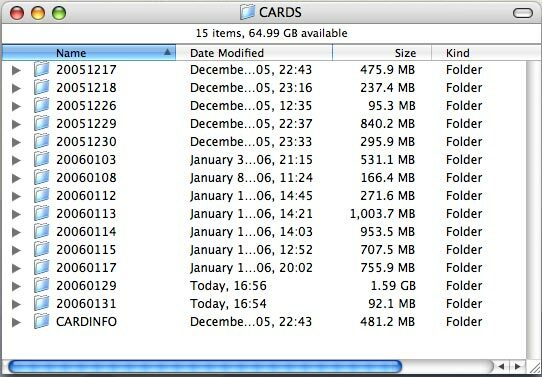 If you simply copy photos from cards to the P-4000, it automatically arranges them in directories according to the date they were imported – 20051217 corresponding to Dec. 17, 2005 – without renaming the photos. The photos are fully available, and can be previewed, copied, moved, or deleted; they simply aren’t in named directories. When the P-4000 is connected to a Mac, these folders are displayed as directories, and can be transferred to the Mac simply by dragging them. 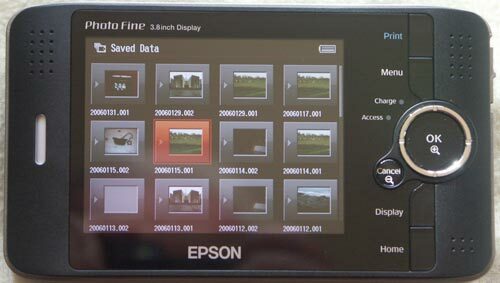 Epson does not have the portable “photo vault” market to itself. You can store photos on an iPod Photo or one of the new video-capable iPods. Using the Camera Connector accessory and a cable, you can transfer photos directly from the camera into the iPod. But an iPod is a poor photo vault. 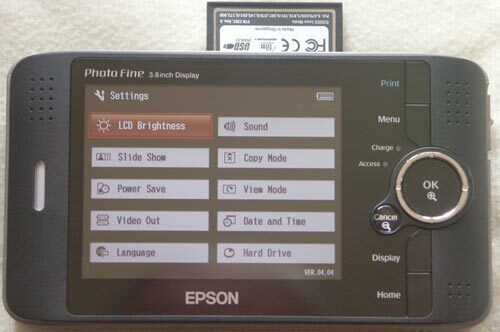 The first problem is the transfer process: both the iPod and the camera must be turned on and operating; with the Epson unit, you remove the card from the camera and insert it directly into the P-4000, using none of the camera’s precious battery power. The second problem is the iPod’s tiny screen. While the screen dominates the P-4000’s body, the click wheel dominates the iPod’s body, and the iPod screen has less than a quarter of the resolution, and no ability to zoom in to a photo. Wolverine (http://www.wolverinedata.com/) has a less expensive product, called the FlashPac, but it has an alphanumeric screen without any ability to display photos at all. You can’t tell what your photos look like, or even that they’ve properly transferred. A newer Wolverine product, the MVP, does have a color view screen, but it is tiny, about the size of the iPod’s screen, but with none of the elegance of design of either the iPod or the P-4000. Bluntly put, it is less functional, and it looks cheesy. 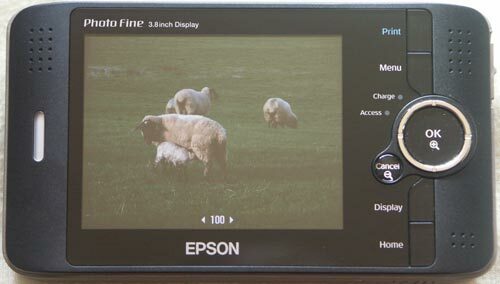 My spouse wants you to know that buying the Epson P-4000 was her idea, and that it was far easier to pack, carry, store, and secure than any laptop, Mac or otherwise. Since it also prevented either one of us from reading E-mail or writing papers or proposals, it helped us enjoy our time off from work far more. The Mac-like simplicity, the marvelous built-in color screen, and the ability to zoom in on photos to check details made it a joy to use, and dumping the files to a Mac once we were home was simple and straight-forward. I didn’t want to spend the money, arguing that the laptop we already have was possibly more cumbersome but just as useful. I was wrong: the Epson P-4000 is actually a better, easier to use, easier to transport photo vault than a PowerBook. If you are even a halfway serious digital photographer, give it serious consideration. 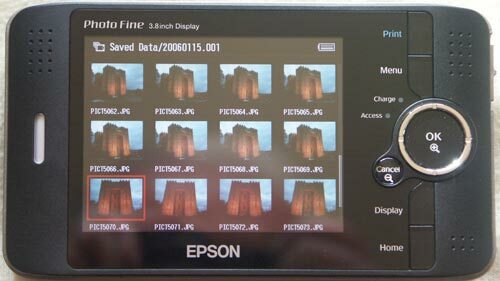 Available at Penn Camera (Washington, DC, area camera store) as well as at online photography merchants.